SathishFx : 14-02-2018 to 14-02-2018 : The Oval @ Ocean spray resorts Ecr pondicherry. How special is your Valentine? Here's a chance to express your love to your special ones at Ocean Spray Beach Resort, on the special occasion of Valentine's Day! 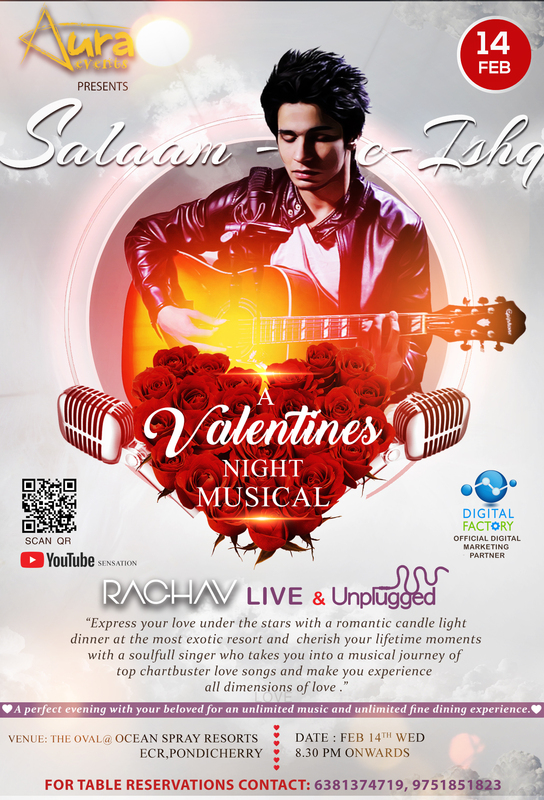 Aura Events bring you - 'Salaame-e-Ishq' - a Valentine's Night Musical event to celebrate love with soulful romantic songs - live and unplugged, on 14-Feb-2018 Wednesday evening between 8.30 p.m. & 11.30 p.m! Separate table for each couple.